RANDOM.ORG SELECTED #5 AS THE WINNER. Congrats to Page Turner! 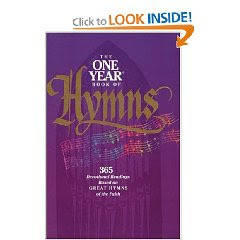 My mom had a copy of The One Year Book of Hymns when I was growing up but I never paid much attention to it. Then early in December this past year, I stumbled across two used copies of it and grabbed both. One for myself and one to giveaway to one of you. I'm reading through this book over the course of this coming year and from time to time you might find some "inspiration" filling up some blog posts. You can read or ignore, the choice is yours. I'm sure that some days I'll feel more inspired by these tried and old hymns of the faith than others. Interested in winning my spare copy? (I know you'll receive it after the first of the year but oh well. Better later than never! Perhaps you might just want to use it as a resource book, rather than a devotional.) Leave a comment no later than Sunday, January 4th and I'll select a winner Sunday evening before I go to bed. Make sure to leave a valid e-mail address for me to contact you! I would love to win your spare. I never paid much attention to Hymns growing up but now I see the richness in knowing hymns. They are so full of meaning. Hope I win so I can read them daily. I love the hymns--I've always thought someone should write a Bible study or something on understanding theology through music. This book sounds great! I would enjoy this book as would the urchins. Thanks, Carrie, in behalf of whoever wins, for picking up two copies. I'd love to win the extra one -- it sounds like a fascinating book. What a great book to give away. We love the Hymns for a Child's Heart series by Joni Erikson Tada, and this would be a great resource for further insights for both the adults and kids. Please enter me! Pick me -- pick me! I love hymns, and would love to use them as a devotional tool this year. I agree with Stephanie's Mommy Brain about the Joni books on hymns being great - they come with CDs of the music, too! I just posted recently on how much I love hymns, and how I miss them since our church doesn't use them anymore :( I play a hymn for my girls each night after dinner and would just love this book! I'm so excited that I won this book! It will be a great addition to our family library. Thank you soooooo much!